Michigan State University has received more than $3.6 million to study diseases spread in animals. Three grants worth $2.7 million came from the United States Department of Agriculture, which will help farmers protect livestock and increase food security and production in the nation. An additional $907,000 came from National Science Foundation Faculty Early Career Development grant, which is one of NSF’s most prestigious awards for pre-tenured faculty. The grant from NSF will help researchers at Michigan State university study West Nile virus and Bird flu. $1 million was awarded to Lorraine Sordillo, who is a professor in the Department of Large Animal Clinical Science at Michigan State University. The grant will help Professor Sordillo develop best practices to reduce diseases that affect transition dairy cattle and manage farm production losses. Professor Sordillo’ s research will also help cows cope the high-energy transition before and after having a calf when cows’ metabolic needs increase dramatically. His study will lead to reduce dairy production losses. $960,000 was awarded to Paul Bartlett, who is a professor in the Department of Large Animal Clinical Sciences. The grant will help prevent Bovine Leukemia virus, which has a significant negative impact on the U.S. dairy industry. $750,000 was awarded to Janice Siegford, assistant professor in the Department of Animal Science. Professor Siegford’s research will develop behavioral and genomic tools to help improve swine interaction in group-living settings. Professor Siegford is seeking ways to reduce undesirable behaviors, such as fighting, which can affect the performance of swine and lead to injuries, lameness or death. $907,000 from NSF was awarded to Jen Owen, assistant professor at the Michigan State University Department of Fisheries and Wildlife and Department of Large Animal Clinical Science. Professor Owen is studying the path that those two viruses are spreading. In her study, Professor Owen will investigate the effect of environmental and genetic factors on a bird’s response to West Nile virus and avian influenza virus. By measuring differences within individuals in birds, she will predict the course of disease outbreaks, and develop targeted control and prevention strategies for animals and people. More than $3.6 million in research funding will support researchers at Michigan State University to develop their research to observe and investigate environmental conditions and methods that change the speed and intensity of a disease epidemic. These investigations will provide Michigan researchers the opportunity to take an active role in developing and testing predictions about the consequences of environmental disturbances to global health. Each year Michigan State University attracts more than $477 million in external research funding, which supports more than 300 scientists who conduct research in on-campus facilities and at 13 outlying research centers across the state. In 2013 Michigan State University received nearly $50 million in research funding from the National Institutes of Health, and more than $22 million as of June 2014. Biotechnology Calendar, Inc. organizes the Annual MSU BioResearch Product Faire™ Event to help laboratory supply companies connect with academic researchers in East Lansing. 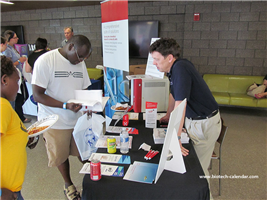 The 4th BioResearch Product Faire™ Event at Michigan State University is on July 23rd 2014. 27% were purchasing agents, professors and post docs. All attendees were active research hands. These attendees came from 19 different research buildings and 30 on-campus departments. If you are a laboratory supply company interested in exhibition at the BioResearch Product Faire™ Event at Michigan State University on July 23rd 2014, please click the button below. There are more events available at different institutions across the nation. Please read the Show Schedule for 2014.